Whether it is the internet, newspapers, magazines or your doctor's office, strength training for older adults is becoming increasingly popular. Geri-Fit has lead the way since the early 1990's as a pioneer of strength training exercise programs for older adults. Geri-Fit has been featured on CNBC, Yahoo Finance, Bloomberg BusinessWeek, the National Council on Aging's newsletter, the Administration on Aging's (AoA) website as a Tier III, evidence-based health promotion program, the Press Enterprise, the Southwest Riverside News Network, Topix, ABC news, West Side Leader, the Plain Dealer, Sun Newspapers, the Akron Beacon Journal, AAA, Readers' Digest, Newsday, Business Opportunities Handbook, Billboard Magazine, Crain's Business, the Jewish News, Country Review, the San Clemente Times, Orange County Register, the North County Times, Neighbors Newspaper, Patch, Menifee Buzz, the Valley Chronicle and many others. Geri-Fit has also been featured on WEWS News Channel 5, WKYC, WTAM and many other television and radio shows. April 18, 2019 - Arthritis Patient Services of Charlotte, NC signs an extensive license agreement with Geri-Fit to offer evidence-based strength training classes at 8 of its locations in Charlotte, Pineville, and Mint Hills. April 15, 2019 - Gilford Public Library, as well as a dozen other libraries that were involved in the 12 week national Geri-Fit study, will be continuing on with Geri-Fit! The program was such a huge success, their senior community just doesn't want to stop! Check out their catchy Spring newsletter mentioning the variety of the health and wellness programming that they offer to their older community. Now that's a busy community library!! April 10, 2019 - Region 1 AAA in Phoenix, Arizona has expanded their blanket license and continues to add new locations to the Geri-Fit map. Four new locations will offer Geri-Fit classes this Fall in Surprise, Mesa, and two more in Phoenix. April 9, 2019 - Geri-Fit welcomes Garfield County in Rifle, Colorado who will be offering the Geri-Fit program at five new locations this spring! April 8, 2019 - Grand Saline Public Library is our newest Geri-Fit virtual site. Their library will be conducting DVD classes starting in May. April 2, 2019 - Geri-Fit welcomes Jasper County Public Library as our newest licensee. Jasper marks our 5th location in the state of Indiana with hopefully more to come! March 28, 2019 - Mt. Si Senior Center in North Bend, Washington has joined the national network of senior centers offering virtual fitness at their intergenerational centers. March 20, 2019 - Paullina Public Library (Paullina, Iowa) joins libraries across the nation that are now offering Geri-Fit virtual fitness classes. For more information on obtaining a Public Performance License, visit this link on our website. March 8, 2019 - St. Michael's Church in Craig, Colorado has 16 signed up for its Geri-Fit classes. Licensee Anita Reynolds has done an excellent job at keeping her group engaged... now in their 4th year and continuing to get stronger, confident, and more independent! March 6, 2019 - First round stats in! 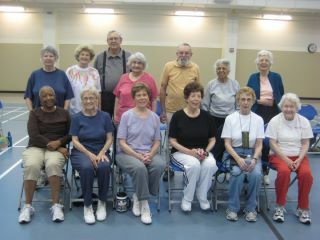 835 older adults are currently participating in the Geri-Fit virtual fitness (DVD-led classes) nationwide study throughout the U.S.
March 5, 2019 - Columbus County Department of Aging (N. Carolina) signs with Geri-Fit to become licensed to provide the Geri-Fit program at seven of its senior centers throughout their County. March 5, 2019 -- The Geri-Fit program is featured in a new college textbook! March 3, 2019 - New Hanover County in North Carolina has opened another new location... this time at Castle Hayne. To read about their grand opening, click here. 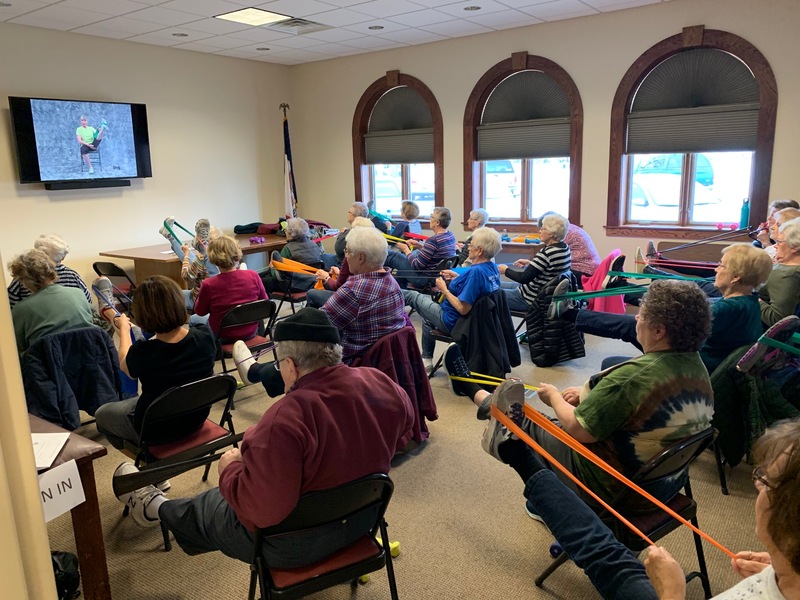 February 15, 2019 - West Point Library of Iowa shared a photo of their group exercising to the 15 Exercises That Help to Previous Osteoporosis DVD. Here a group of older adults are warming up for the workout by doing their flexibility stretches for their hamstrings. West Point Library is one of 54 libraries that are hosting sites for the national study for Geri-Fit virtual fitness classes. January 29, 2019 - The Geri-Fit Company received notification from The Department of Consumer and Business Affairs that is has met the requirements and is approved as a certified small business with the County of Los Angeles Community Business Enterprise (CBE) Program. January 28, 2019 - Nirvana Digital TV expands its contract with the Geri-Fit Company to include its two new newest workouts, Workout #6032 and Zoomers Weighted Lunge. The workouts are part of the older adult wellness programming offered by the Brazilian television station and will be available this Spring through pay-per-view TV. 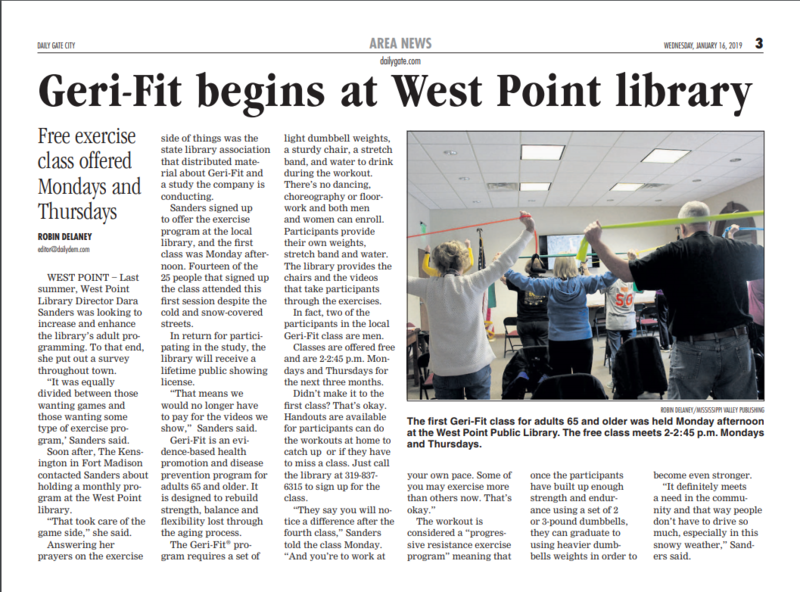 January 16, 2019 - The Gateway Mississippi wrote a feature article on the new virtual fitness program, Geri-Fit, that's held at the West Point Library. To read the article, Click Here. 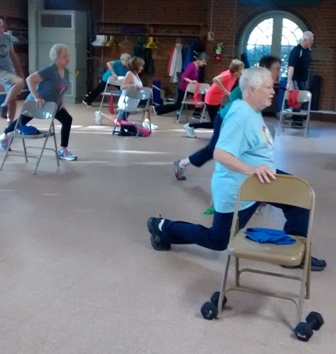 January 10, 2019 - Instructor Spotlight to Mary Konicki, age 85, who leads Geri-Fit classes at the New Hanover Senior Resource Center in North Carolina each week. Mary, you are looking fit and helping all these people so much in your class! You're such an inspiration to all of us and our hats are off to you. Keep up the great work! To see photos of Mary teaching her Geri-Fit class, view this link. January 9, 2019 - Staunton Public Library in Virginia kicks off the brand new year by offering Geri-Fit classes. Click to read the article that appeared in the Sun Messenger. January 8, 2019 - The Sundance Times gave a little plug to Crook County Library (Wyoming) for Geri-Fit classes starting January 15. January 7, 2019 - Way to go! La Cygne Public Library has over 50 older adults signed up for Geri-Fit classes starting next week!!! January 2, 2019 - Morton-James Public Library (Nebraska) joins the growing list of libraries engaging in health promotion programs for their older adult communities. We are glad to have you on board! January 1, 2019 - Congratulations to our first licensee in the new 2019 year... Ringsted Public Library (Iowa). Best wishes on a successful launch of your new Geri-Fit program! December 31, 2018 - The Daily American features a vast array of evidence-based health promotion disease prevention programs in Somerset, Pennsylvania. Here's a sampling of one week of planned activities. December 28, 2018 - Daviess County Library got a tremendous article written about their involvement in the Geri-Fit study. December 26, 2018 - The Duncan Banner printed an article about its library being selected as one of the 60 sites that will participate in a nationwide study that begins the week of January 14. To read more about their library's involvement, click here. December 22, 2018 - The Oneida Dispatch did a nice little write up about their library's new Geri-Fit program that's starting in January. To read the article, click here. December 19, 2018 - Today is the due date for Letters of Intent for the CDSME grant, HHS 2019-ACL-AOA-CSSG-0311, Empowering Older Adults and Adults with Disabilities through Chronic Disease Self-Management Education Programs Financed by the Prevention and Public Health Funds. Geri-Fit is an approved self-management support program that is eligible under the $6.3M grant. December 2, 2018 - Pella Library got a nice write up about their library's involvement in the new national study about Geri-Fit's new video line of fitness products. To read the article, Click here. November 12, 2018 - The Dubois County Herald reported the new national study that takes place starting the week of January 14. Click here to read the feature article. November 8, 2018 - The Dubois County Free Press wrote an excellent article about its local library being selected as a hosting site for the upcoming 2019 national study involving the Geri-Fit program. To read the article, click here. October 6, 2018 - Geri-Fit was featured in the National Institute of Health's (NIH) Go4Life's monthly newsletter. October 5, 2018 - The Craig Press wrote an article about Moffett County's Geri-Fit program and interviewed their new senior center director, Krystal Baker. 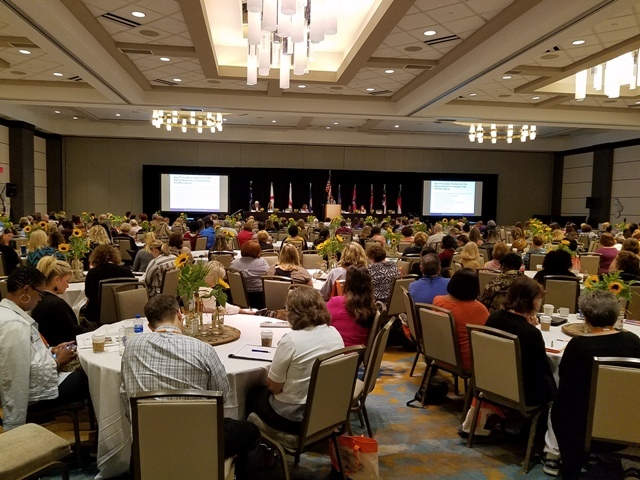 Oct. 1, 2018 - Geri-Fit continues its national tour attending Area Agency on Aging conferences throughout the U.S. In this photo taken at the opening reception, Sandy Markwood of N4A addresses over 300 conference attendees at the SE4A Conference held in Louisville, KY. Geri-Fit Company was exhibiting at the conference and made valuable contacts with AAAs and CBOs throughout southeastern U.S.A. including Florida, Virginia, S. Carolina, N. Carolina, Kentucky and Georgia. Look for new locations on our national map to be added soon! 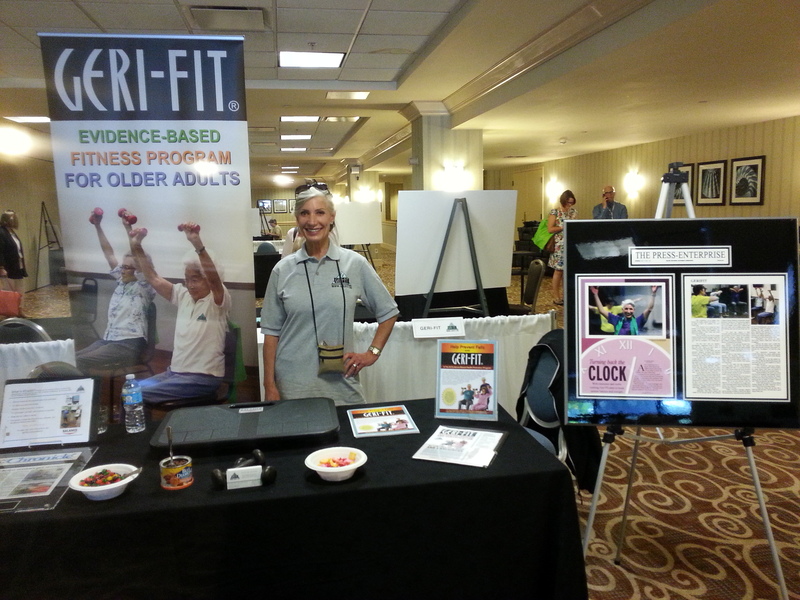 September 30, 2018 - Geri-Fit exhibited at the SE4A Regional Conference. What a fantastic conference. The speakers were outstanding! 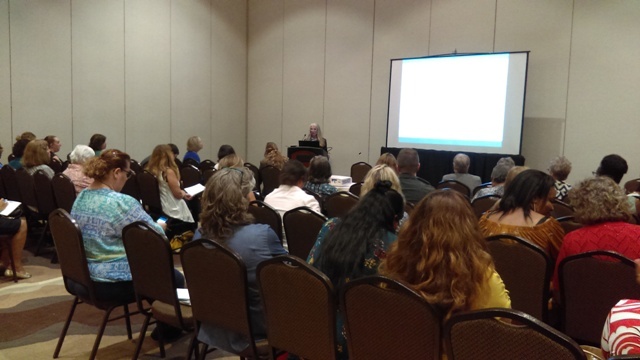 Sept. 21, 2018 - The Geri-Fit Company presented at the AZ4A Conference in Mesa, AZ. During the presentation given by founder and program developer, Francesca Fisher, Area Agency on Aging directors and program administrators learned about the advancements in fall prevention training and the role proprioceptive exercises play in enhancing power and balance in aging older adults. Sept. 10, 2018 - 12 instructors from Wilkes-Barre, Pennsylvania graduate from Geri-Fit's Program Fidelity Training, Advanced Strength Training Techniques and Fall Prevention. Sept. 3, 2018 - The Senior Center in Craig, Colorado has added a new time slot for their Geri-Fit class. To read the Chamber of Commerce's article, click here. Sept. 2, 2018 - Eagle Mountain City Library is the newest virtual hosting site for Geri-Fit video-led classes. July 24, 2018 - Fox 56 highlighted the health and wellness classes offered through the Luzerne-Wyoming Area Agency on Aging. This news segment about their Geri-Fit program aired on TV 56. July 21, 2018 - Geri-Fit news on LinkedIn announcing our national roll out of the Geri-Fit program at libraries throughout the U.S.
July 16, 2018 - Geri-Fit was featured in the July 2018 newsletter for Let's Move in Libraries - a new initiative to offer physical fitness programs at libraries. To read the article about the new virtual fitness study, click here. July 13, 2018 - Geri-Fit Company attended the 2018 ASCA Conference held in Mesa, Arizona. June 24, 2018 - Geri-Fit's founder, Francesca Fisher, has been asked to speak at the AZ4A Conference being held in Mesa, Arizona on September 20-22. To view the full line up of conference speakers, click here. 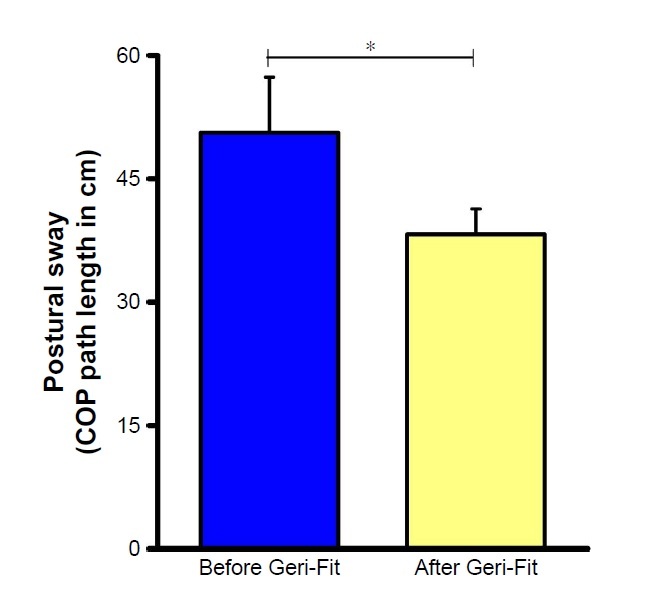 June 17, 2018 - Combination of BTrackS and Geri-Fit as a targeted approach for assessing and reducing the postural sway of older adults with ... - new results! 6280 people now added to Balance Tracking System's data which included the original Geri-Fit participants from 2017. May 26, 2018 - The Geri-Fit program was referenced in a study published by Elsevier Journal of Biomechanics May 3, 2018. May 22, 2018 - Yoga Chuck, Seneca County's (OH) first Geri-Fit licensee, got a wonderful article written about him and his new yoga studio which opened last month. Geri-Fit classes are offered there on Mondays and Wednesdays at 1:15-2:00 pm. May 20, 2018 - Yakama Nation in Toppenish, Washington is the first Geri-Fit licensee in the state of Washington. We welcome them to our nationwide network. March 30, 2018 - Valley News published an article about the Geri-Fit program being part of funding for a new chronic disease management grant. March 28, 2018 - ABC news does a feature story on Durham, North Carolina Geri-Fit participant celebrating her 100th birthday. March 27, 2018 - Attendees gather around the Geri-Fit table at the Ohio Association of Senior Centers' 59th Annual Conference. March 19, 2018 - Geri-Fit's "Certification Course for Geri-Fit Instructor" online course receives accreditation approval from the National Certifying Council for Activity Professionals (NCCAP). The online course is available exclusively to licensees and their instructors and is accredited for 19 contact hours. March 1, 2018 - Geri-Fit is named as one of the 11 pre-approved, evidence-based chronic disease management support programs for HHS-2018-ACL-AOA-CSSG-0256's grant, Empowering Older Adults and Adults with Disabilities through Chronic Disease Self-Management Education Program Financed by the Prevention and Public Health Fund. Grant applications are due by April 30, 2018. February 22, 2018 - The CDC recognizes the Geri-Fit evidence-based physical fitness activity program as a chronic disease self-management support program under its "other" category in grant opportunity CDC-RFA-DP18-1803 NOFO. The NOFO’s purpose is to implement state-based approaches to improve arthritis management and quality of life for adults with arthritis. For more info, visit their FAQ page at this link. February 8, 2018 - Licensee Carole Zicha has opened two new Geri-Fit locations in Clymer and Indiana, Pennsylvania! January 19, 2018 - The Area Agency on Aging of Phoenix Arizona has opened three new Geri-Fit locations located in Guadalupe, Glendale and Phoenix. Classes will begin this Spring. Check back for additional locations that will soon be added to their ever-growing list. January 12, 2018 - Lancaster County Office on Aging (Pennsylvania) got a nice write up in Lancaster Online about their Geri-Fit program offered at Lititz Senior Center. January 9, 2018 - The Geri-Fit Company welcomes the Kathryn Heidenrich Adult Center who will begin offering virtual Geri-Fit video classes next month at their center. December 27, 2017 - Geri-Fit would like to congratulate the Tuscarawas County Senior Center, our newest licensee in Ohio. They will begin offering Geri-Fit classes in March, 2018. December 26, 2017 - It might be cold in Ohio, but Geri-Fit classes are heating up fast at The Friendship Center in Dover, Ohio who will begin offering Geri-Fit classes in February, 2018. December 23, 2017 - Chatham County (North Carolina) will begin offering Geri-Fit classes in January, 2018 at the Western Chatham Senior Center and the Eastern Chatham Senior Center. Congratulations to our newest NC licensee! December 22, 2017 - Congratulations to the Central Midland Council of Governments (South Carolina) as the winner of the Geri-Fit Public Performance License raffle that was held December 12 at the SE4A Conference in Greenville, SC. December 2, 2017 - Craig Colorado offers a nice array of exercise classes at their Center. Here's a list of some of the offerings. December 1, 2017 - Some more virtual fitness being reported from all over the world. See Geri-Fit listed on page 29 of this published report. October 3, 2017 - Natural Awakenings Magazine featured a great article on the newly-accredited Geri-Fit Instructor Training Program for caregivers, health coaches, evidence-based program leaders and other healthcare professions that need this specialized training. To read the entire article, click here. October 2, 2017 - The National Institutes of Health published the events that took place during the month of September in recognition of Fall Prevention. Geri-Fit is mentioned midway down. 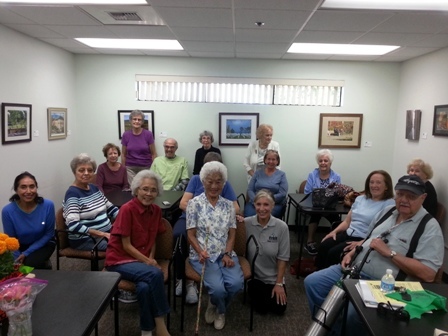 We provided a fall prevention presentation and exercise demonstration at Renaissance Village of Murrieta, California. Proven strength training exercises performed with small dumbbell weights can increase strength, improve balance, and decrease postural sway. September 21, 2017 - The Geri-Fit Company announces the release of their new online caregiver training course. September 18, 2017 - The Geri-Fit program got a mention in the National Institute on Aging's Go4Life e-newsletter today. Thank you! September 15, 2017 - Fall Prevention Week starts this Monday! To help reach as many seniors as possible, we're offering free Fall Prevention Workshops throughout the U.S. See this facebook page for details. September 13, 2017 - Radio talk show host Roger Marsh from the Bottom Line interviews Francesca Fisher, program developer and founder of the Geri-Fit program. To hear the 20 minute interview, visit this link. September 6, 2017 - Geri-Fit's Original Workout with Weights DVD is featured on Pinterest's Strength Training Videos page. September 4, 2017 - Geri-Fit welcomes licensee Ekta Patel who will be offering in-home health classes and group class in Macon, GA.
August 26, 2017 - Geri-Fit welcomes licensee Carole Zicha who will be conducting Geri-Fit classes in Homer City, PA starting this fall. August 9, 2017 - Geri-Fit welcomes licensee Elizabeth Jones who will be conducting Geri-Fit classes in South Carolina and Georgia starting this fall. July 26, 2017 - California CEO featured Renaissance Village of Murrieta, CA, one of the first Geri-Fit licensed senior care facilities in southern California. To view the four minute video, view this link. July 8, 2017 - Geri-Fit welcomes Maria Gianino of Homewatch Caregivers who will begin offering Geri-Fit classes in the St. Louis, MO area. We welcome her as the first licensee for that state! July 7, 2017 - The Geri-Fit Company has been added to the CDC's national map of locations that will be offering diabetes prevention and type II diabetes management programs next year. Geri-Fit was previously approved as an evidence-based chronic disease support program earlier in the year by the AoA/ACL. The company continues to expand its physical activity program nationwide reaching a broader audience than just older adults. July 4, 2017 - The Geri-Fit program was mentioned as a support program the Area Agency on Aging (Ohio) will be offering Geri-Fit classes when it moves to its new location on Allentown Road next week. To read the article, click here. July 3, 2017 - The Geri-Fit Company expands its long term endorsement with American Specialty Health (Silver&Fit) to provide sustainability for evidence-based programs and chronic disease self-management support programs held at senior centers throughout the U.S.
June 30, 2017 - Piedmont Triad Regional Council signs with the Geri-Fit Company to become licensed to offer the evidence-based health promotion program at three of its senior centers located in Mayodan, Greensboro, and Kernersville, North Carolina this fall. June 21, 2017 - Geri-Fit welcomes Lancaster County Office on Aging as its newest program licensee where Geri-Fit classes will be offered at three senior centers in Lancaster County, PA beginning next month. June 17, 2017 - Renaissance Village of Murrieta, California debuts its new commercial featuring the Geri-Fit program that's held at two of its assisted living facilities in southern California. To view the commercial, click here. June 15, 2017 - The Geri-Fit Company exhibited at the NANASP / NISC National Conference in Oak Brook, Illinois this week meeting state aging directors and senior center directors from all over the U.S. The conference was a huge success. 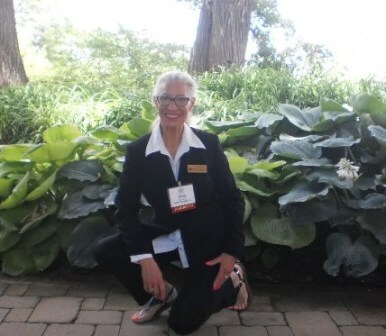 Here's a photo of Geri-Fit founder, Francesca Fisher, posing in front of giant hostas at the well-manicured Hyatt grounds and McDonald's University campus. June 15, 2017 - The Geri-Fit Company welcomes Troy Senior Center in North Carolina as its newest licensee who will feature virtually-led Geri-Fit classes at their senior center starting in the Fall, 2017. June 7, 2017 - Somerset County Area Agency on Aging signs with the Geri-Fit Company to become licensed to offer the evidence-based program. Central City Center, Conemaugh Township Center, Confluence Center, and Somerset Center will begin offering Geri-Fit classes next month. 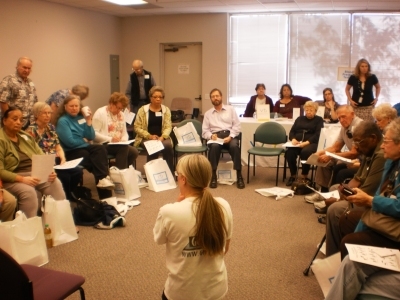 We're looking forward to bringing this wonderful program to your communities! June 5, 2017 - The Allen Eiry Center in Tiffin Ohio launched their new Geri-Fit program today with eight people signed up for the next 16 weeks! Way to grow strong!! June 2, 2017 - The Geri-Fit Company welcomes Juliet Long who will be expanding Geri-Fit classes into Ojai, Ventura County, Carpinteria and other nearby locations starting this summer. We welcome her to our licensed team of nationwide instructors! May 30, 2017 - Geri-Fit classes at Humana Wellness Center start up at this brand new location in Murrieta, CA led by Licensee Janice Lee. FREE to the community with valid Silver Medicare plans. May 27, 2017 - The Craig Daily Press writes about the two new locations where Geri-Fit will be offered in Craig Colorado starting in June. To read the entire article, click here. March 30, 2017 - The California Dolphin printed a great article on Geri-Fit and the improvement the EB program has on balance. Click to read. March 11, 2017 - Seniors living in Wake Forest, NC came out to celebrate the grand opening of the Geri-Fit program in their community hosted by the Northern Wake Senior Center and Resources for Seniors. February 28, 2017 - The complete balance study using the Geri-Fit program now published on pubmed.gov. Participants' postural sway improved 80.8% over a 90 day period. February 27, 2017 - The Herald Sun in Durham, NC wrote a wonderful article on why couples that play together, stay together. Geri-Fit is mentioned as one of the activities that the Durham Center offers. February 13, 2017 - A new study published today in Clinical Interventions in Aging reported that older adults age 65+ participated in the Geri-Fit top tier evidence-based health promotion program and showed an 80+% improvement in balance over a 90-day period. To view the entire study entitled Combination of BTrackS and Geri-Fit as a targeted approach for assessing and reducing the postural sway of older adults with high fall risk, please visit this link. January 29, 2017 - What a busy month for Geri-Fit! Announcing our new licensees who will be launching the Geri-Fit program this Spring: Yoga Chuck from Tiffin, Ohio joins the Geri-Fit network as well as Resources for Seniors which will offer the Geri-Fit program at senior centers in Wendell and Wake Forest, North Carolina. January 15, 2017 - The Geri-Fit program got a mention in the Journal for Nurse Practitioners January 2017 issue. Strong, http://www.fitandstrong.org/. Functional Focused Care, http://www/. January 10, 2017 - Long term Geri-Fit results were released today for three Ohio senior centers where the program has been in place for more than 10 years. 76% found the Geri-Fit program improved their strength, and 45% found the program improved their balance. To read the entire survey results, click here. January 7, 2017 - The Area Agency on Aging for Luzerne and Wyoming Counties made news again in the Sunday Dispatch. An additional time slot for Geri-Fit classes is being added to the schedule and will start on January 12. December 20, 2016 - Geri-Fit welcomes its third licensed YMCA location, Wilmington Family YMCA in Wilmington, NC. Welcome aboard! December 17, 2016 - Prime Time Health of Steubenville, Ohio joins the Geri-Fit network of senior centers throughout the U.S. offering the Geri-Fit EB program. November 25, 2016 - Guernsey Senior Center, located in Cambridge, Ohio, signs with the Geri-Fit Company to offer the tier III evidence-based Geri-Fit health promotion program at their senior center in 2017. October 31, 2016 - The Geri-Fit Company celebrates its 22nd year in business! October 30, 2016 - Geri-Fit welcomes Renaissance Village Murrieta, California who will begin offering Geri-Fit classes to their residents in November. Renaissance Village Murrieta is the first memory care facility in the Inland Empire area. October 27, 2016 - Geri-Fit welcomes Noreen Poli of Prime Personal Fitness. Noreen will be offering group classes and one-on-one Geri-Fit classes in the Tucson, Green Valley and the Sahuita areas in Arizona. September 16, 2016 - The Sunday Dispatch features an article on Geri-Fit and classes held in Pittston, PA.
September 1, 2016 - Geri-Fit's founder, Francesca Fisher, was interviewed by caregiver.com. To read the article, click here. August 23 2016 - The Geri-Fit Company and Balance Tracking Systems conduct a free balance test at Kay Ceniceros Senior Center in Menifee, CA. Thirty-seven seniors ages 65 to 96 attended the event. The balance expo kicks off National Falls Prevention Awareness month which starts next week and is held every September. The senior center will be holding a Falls Prevention Expo and Demonstration of Strength Training Exercises on Thursday, September 22 from 9:00-9:45 am. To RSVP, call the Kay Ceniceros Senior Center at 951-672-9673. August 18 2016 - The Geri-Fit Company gets approved as an Exhibitor at the NISC Conference held in Philadelphia, PA September 25-28, 2016. 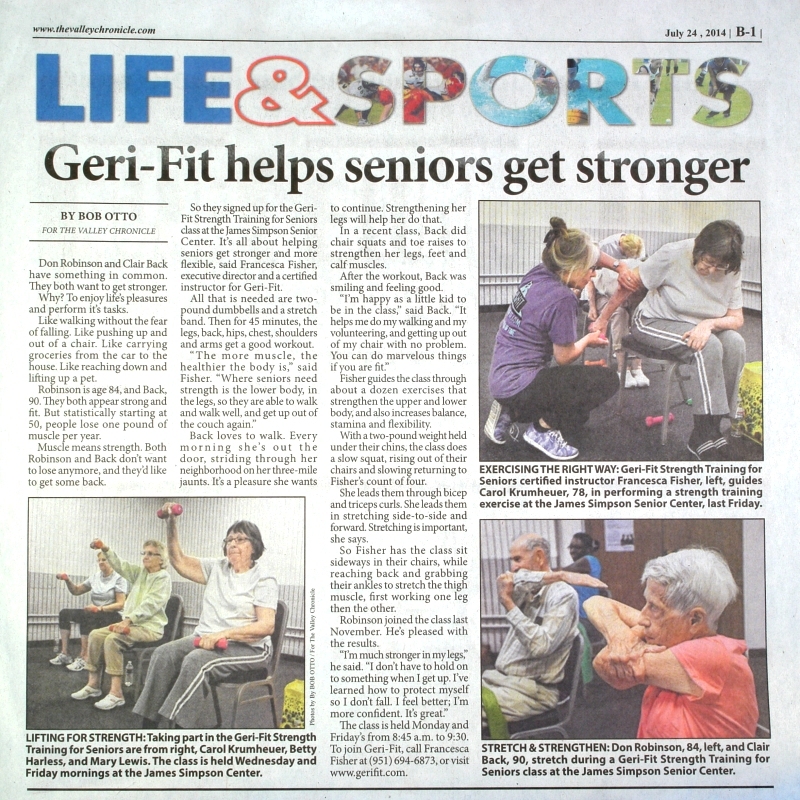 August 6, 2016 - Veteran instructor, Doreen Rakowski, a certified Geri-Fit instructor for the Area Agency on Aging for Luzerne and Wyoming Counties, is interviewed for a newspaper article appearing in the Times Leader. Doreen has been teaching fitness classes for over 20 years! July 27, 2016 - The N4A holds its 41st Conference in San Diego, California where Geri-Fit exhibited at the tradeshow and debuted its newest product for testing postural sway, Balance Tracking Systems. Shown here is Francesca Fisher, creator of the Geri-Fit program. July 23, 2016 - The City of Pittston, Pennsylvania got a favorable article about its newest exercise program, Geri-Fit that begins there next week. Click here to read the article. July 20, 2016 - The Area Agency on Aging, Region 1 signs a License Agreement to offer Geri-Fit exercise classes at 10 locations in the Phoenix, Arizona area starting this Fall. July 19, 2016 - The Geri-Fit Company welcomes Licensee Annette Yates of Setay Dance and Fitness located in Phoenix, Arizona. Her studio will be offering Geri-Fit group classes and personal fitness training. Click Here to visit her website and class offerings. July 15, 2016 - The Geri-Fit Company welcomes Licensee Nina Parkinson who will be offering Geri-Fit classes through the City of West Hollywood, California starting September 6. July 14, 2016 - More news for the Area on Agency for Luzerne-Wyoming Counties in Pennsylvania. Six more locations will be offering Geri-Fit classes at the Wilkes Barre YMCA, the JCC, the Hazelton YMCA/YWCA, Edwardsville Active Adult Center, the Turnhannock Public Library, and the Pittston Active Adult Center. You can read about the openings in the Wilkes-Barre Times Leader article. July 1, 2016 - The Geri-Fit Company is featured in the July issue of Natural Awakenings magazine. To read the article, Click Here and flip to page 14. June 23, 2016 - The Citizen's Voice in Wilkes-Barre, Pennsylvania published a story on several locations that will be offering the Geri-Fit evidence-based health promotion program including the JCC, YMCA and Edwardsville Adult Activity Center. To read the article, click here. June 22, 2016 - The National Highway Traffic Safety Administration (NHTSA) archives reference the Geri-Fit® exercise program in their Safe Mobility for Older Drivers report. June 17, 2016 - The Geri-Fit Company is asked to present, alongside with other Tier III evidence-based health promotion and falls prevention programs, at the Evidence-Based Poster Social at the N4A's 41st National Conference and Trade Show on July 27 in San Diego, California. June 15, 2016 - Geri-Fit licensee Lisa Harris, RD, ACE-CPT is featured in a news story in the Valley News about her second Geri-Fit opening in Lake Elsinore, California. To read the article, click here. June 1, 2016 - The Geri-Fit Company is asked to be a presenter at the Arizona Senior Center Association's annual conference being held on July 18. The presentation will be "It's All About Balance." May 31, 2016 - The Area on Agency for Luzerne-Wyoming Counties signs a License Agreement with Geri-Fit Company to offer Geri-Fit classes at 22 locations in Pennsylvania. May 21, 2016 - Brunswick Senior Resource Center adds seven new locations to their existing three locations under the new Geri-Fit blanket license agreement. May 20, 2016 - The Geri-Fit Company signs with the City of Boca Raton, Florida to offer continued education programs through its Community Services Department. May 19, 2016 - The Geri-Fit Company films its 14th exercise video to be aired on Brazilian television starting in July. May 13, 2016 - The Geri-Fit Company agrees to exhibit at the N4a Conference being held at the San Diego Convention Center July 25-28. May 10, 2016 - The Geri-Fit Company becomes a Silver Sponsor and exhibitor at the Arizona Senior Center Association's annual conference that will be held in Tempe Arizona on July 10-13. May 4, 2016 - The Geri-Fit Company agrees to exhibit at the California Area Agency on Aging's Conference in Los Angeles November 14-17. May 2, 2016 - The Geri-Fit Company has a feature article in Awareness Magazine's May/June 2016 issue. To read the article, go to page 16 after getting on this link. April 24, 2016 - The Geri-Fit Company becomes a member of the Florida Senior Center Association. April 4, 2016 - New Hanover County (North Carolina) gets a nice write-up in their local newspaper about the new Geri-Fit program. Click here to read the article. March 6, 2016 - The Valley News reported the national award the Geri-Fit Company and the Kay Ceniceros Senior Center received from the National Institute of Senior Centers (NISC). To read the online article, Click here. 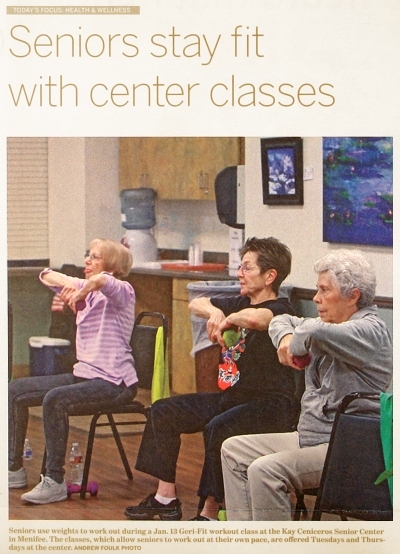 March 5, 2016 - Neighbors Newspaper writes about the new morning time slot for Geri-Fit classes held at the Kay Ceniceros Senior Center beginning in April. The afternoon time slot has been consistently sold out for more than a year. The new morning time slot will help accommodate more older adults wanting to enroll in the Geri-Fit strength training and fall prevention program. March 4, 2016 - The Geri-Fit Company welcomes Licensee Charlene Taylor who will be teaching Geri-Fit classes to disabled older adults in the Inland Empire area. February 27, 2016 - The Press Enterprise did a wonderful story on the history of the Geri-Fit program and where it is headed for the future. Click here to read the article. February 25, 2016 - Geri-Fit licensee Jane Snyder of Palm Desert, California is featured in an article in Desert Health News. To read the entire article, click here. February 24, 2016 - The Geri-Fit Company welcomes Celeste Caperell who has purchased a license for the Boulder, Colorado area. We will announce the openings of her new locations soon! February 20, 2016 - The Geri-Fit Company was notified that it received an Honorable Mention award in the Nutrition, Fitness and Health Promotion category for the innovative fitness programming it offers at the Kay Ceniceros Senior Center in Menifee, California. The award was given by the National Institute of Senior Centers for "Geri-Fit Private Lessons", a personal fitness training program that is held on Mondays, Wednesdays and Fridays at the KC Center. February 10, 2016 - Geri-Fit is now in four countries! Best wishes in business to Stacey Lieberman who is our third international licensee. Stacey will be offering Geri-Fit classes throughout Montreal Quebec, Canada as well as West Palm Beach, Florida. February 1, 2016 - Geri-Fit arrives at New Hanover County, NC. 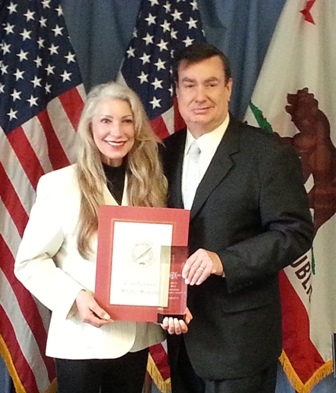 January 16, 2016 - Francesca Fisher stands with Senator Joel Anderson in recognition of the Geri-Fit Company receiving the Best Emerging Business award. January 15, 2016 - Geri-Fit welcomes the Hart Center in Fairfield Bay, Arkansas as its newest licensee. The Hart Center is a Silver&Fit location that will offer the evidence-based program free to its club members. January 14, 2016 - Geri-Fit welcomes Gracious Grannies of Virginia where Geri-Fit will be offered to members of their church. January 13, 2016 - Geri-Fit welcomes Noelhani Hillhouse who will be offering Geri-Fit classes in Littleton, Colorado starting in March. January 7, 2016 - Homestead Hospice published an article written by Francesca Fisher about Fall Prevention in their quarterly newspaper. The article can be found on page 13 of their January, 2016 issue. Click here to read the article. January 6, 2016 - Colorado Hometown Weekly writes about the Geri-Fit program starting January 20 in Lafayette, Colorado. Click here to read the article. January 1, 2016 - Golden Years Fitness LLC becomes the first licensee in the state of Michigan. December 30, 2015 - New Hanover County in Wilmington, North Carolina signs with the Geri-Fit Company to offer classes at three of its county locations starting in 2016. December 23, 2015 - Neighbors Newspaper reports the new opening of the Geri-Fit program at OsteoStrong in Murrieta, California. December 21, 2015 - The Hometown Reporter in Lafayette, Colorado features a story on Geri-Fit's first Colorado location. FCB Sports Performance Center will begin offering Geri-Fit classes on January 13, 2016. A second location in Westminster, Colorado is expected to release its schedule within the coming weeks. December 11, 2015 - The Senior Reporter featured a falls prevention article on Geri-Fit exercises in their December, 2015 issue. To read the article , Click here (scroll down to page 18). October 31, 2015 - Happy Birthday to Mary A. who is 100 years old today! Mary uses 2 and 3-pound dumbbells in the Geri-Fit class that is held at the Kay Ceniceros Senior Center in Menifee, California. 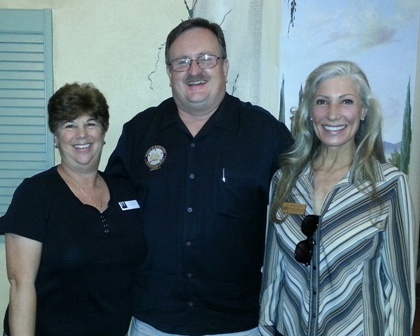 October 30, 2015 - Geri-Fit founder Francesca Fisher (far right) along with Riverside County Supervisor Kevin Jeffries, and Shari Fleischman, Commissioner on Aging for the City of Riverside, enjoyed lunch and a discussion of the future of senior fitness in the state of California at Vincenzo's restaurant in Lake Elsinore, California. October 19, 2015 - Geri-Fit is featured in the October 2015 issue of Senior Life Enrichment Homestead Hope Foundation. Click here to read the article on page 13. October 10, 2015 - Congratulations to our new licensees who will offer classes in Palm Springs, Vista, Valley Center, Temecula, Palm Desert and Perris. October 8, 2015 - Congratulations to our first opening in Michigan! Licensee Denise Elliott will be starting classes soon!! September 29, 2015 - The Geri-Fit Company receives official notification that it has been approved as a certified business with the State of California. July 30, 2015 - Geri-Fit Licensee Lisa Harris of Temecula, CA will be offering FREE Geri-Fit classes throughout the month of September in recognition to National Fall Prevention Month. Classes will be held at Mantra Restaurant's banquet hall located at 27645 Jefferson Rd. in Temecula, CA on Tuesday and Thursday from 10:30-11:15 am. Space is limited and advance registration is required. To register, call Lisa at 951-533-2612. July 2, 2015 - The Geri-Fit Company becomes an approved vendor with the California Department of Social Services (CDSS) for Elderly Residential continuing education programs. Advanced Strength Training Techniques for Older Adults is now an approved CEU course for RCFEs, ARFs, and GHs needing credit hours to keep their licenses up-to-date. April 17, 2015 - Title IIID funding is currently available to facilities and senior centers that are interested and qualify to purchase a Geri-Fit Fitness Program License to have Geri-Fit exercise classes offered to their members or community residents. For more information on the advantages of offering evidence-based exercise programs, visit the Adminstration on Aging's website at this link. There is a link at the very bottom of that page you can click on to download the Title IIID Cost Chart. Geri-Fit is listed on pages 8 and 9. For more information on the Geri-Fit licenses we offer to instructors and facilities, visit Geri-Fit's License Page. 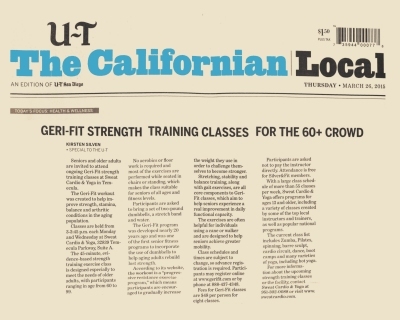 March 26, 2015 - The Geri-Fit exercise program makes front page headlines with a half page article in the Union Tribune newspaper. February 21, 2015 - The City of Menifee and the Menifee Chamber of Commerce held a Geri-Fit ribbon-cutting ceremony at the Kay Ceniceros Senior Center in Menifee. The Geri-Fit Company offers specialized senior strength training exercise classes five-days-a-week at the Kay Ceniceros Senior Center ranging from group Geri-Fit® strength classes, one-on-one personal fitness training, Geri-Flex® Stretch classes, and Golf-Fit® strength and flexibility classes for golfers. Kay Ceniceros is Geri-Fit's most popular location in the U.S. offering various elderly exercise classes 27 hours each week at their facility. To read the article, click on this link from the Valley Newspaper. February 20, 2015 - The Geri-Fit exercise program and DVD product line gets a very favorable review at 3GsStrong.com. Click here to read the review. February 18, 2015- My Temecula Magazine writes on how seniors with certain Medicare plans can take Geri-Fit exercises classes for free! To read the article, click here. 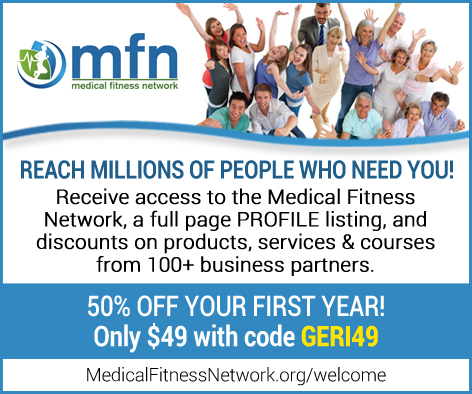 January 28, 2015 - Geri-Fit joins the Medical Fitness Network to help unite fitness instructors worldwide. Instructors should use coupon code GERI49 to get 50% off a one-year membership. January 22, 2015 - The Geri-Fit Company makes the front page of the San Diego Union Tribune newspaper (local Temecula edition) which features the Kay Ceniceros Senior Center in Menifee. 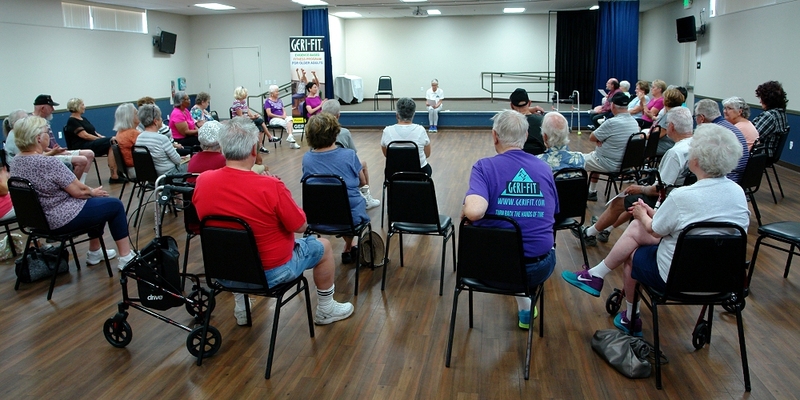 January 17, 2015 - The Geri-Fit class held at the Kay Ceniceros Senior Center in Menifee, California was chosen as the location where the San Diego Union Tribune newspaper will feature a news article on Geri-Fit. The article is due out on January 22. 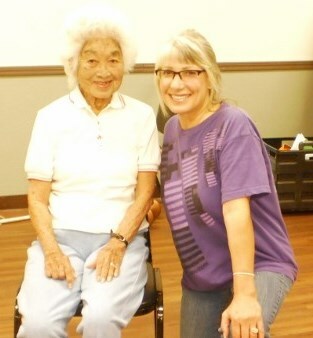 Over 30 seniors are enrolled in the Geri-Fit program at Kay Ceniceros with the oldest member at age 99. Here is a small sampling of the group. Photo courtesy of Stephen Eldred Photography. December 29, 2014 - Athletic Business Magazine features a story on Geri-Fit's newly accredited distance learning course, Advanced Strength Training Techniques for Older Adults. The course has been approved by NSCA and ACE for 2.0 CEUs/CECs. To view the article, click here. December 8, 2014 - The Denver Post features a story on the Boulder, Colorado Geri-Fit Certification workshop. To view the article, click here. November 26, 2014 - Geri-Fit partners with A Place for Mom which offers a free Caregiver Toolkit for families who care for senior loved ones. It's a compilation of actionable resources like charts, checklists, and other "tools" that can help keep caregivers prepared, organized, and less stressed. October 30, 2014 - What a day to celebrate as Mary A. turns 99 making her the oldest Geri-Fitter in the USA! Way to go, Mary!! October 9, 2014 - Renaissance Village of Rancho Belago Moreno Valley, California signs a license agreement with the Geri-Fit Company to become the first retirement community in California to offer the Geri-Fit exercise program to its residents. September 23, 2014 - Geri-Fit is featured on Club Industry's home page announcing the new online instructor training program. August 13, 2014 - The Geri-Fit Company is mentioned in My Temecula magazine in an article about An Optimal You wellness center which offers Geri-Fit exercise classes on Tuesdays and Thursdays. Dr. Laurie Blanscett is the director. To read about her fantastic wellness center and all that it offers, see page 22. July 31, 2014 - The highly successful Geri-Fit program held at the Kay Ceniceros Senior Center in Menifee, California is mentioned in the article Menifee 24/7 did on the change of ownership of the senior center from the County of Riverside to the City of Menifee. To read the article, click here. July 30, 2014 - The Geri-Fit Company is featured in the August, 2014 issue of IHRSA's Club Business International magazine on page 92. July 29, 2014 - Geri-Fit is invited to attend the Eastside Senior Fitness Fair & Expo which will be held on Thursday, August 21 from 9 am to 12 noon at Bordwell Park Stratton Community Center, 2008 Martin Luther King Blvd. in Riverside, CA. 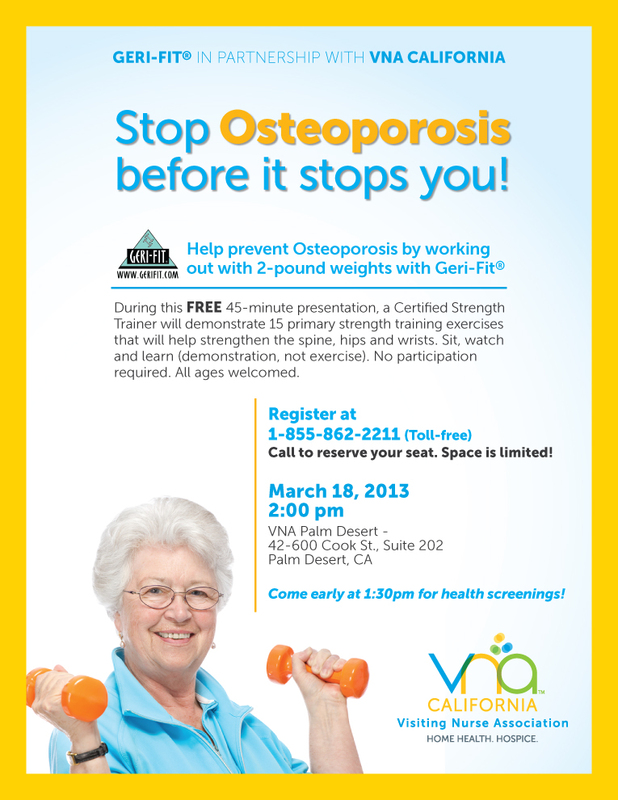 We will be demonstrating strength training exercises that are designed to prevent osteoporosis in addition to providing balance testing. Be sure to stop by our booth! The event is free and open to the public. July 23, 2014 - Geri-Fit continues to get positive news coverage. Here is a great article the Valley Chronicle did on the many benefits that can be attained by 80 and 90-year-olds participating in the Geri-Fit workout. To read the article, click here. April 26, 2014 - The Geri-Fit Company finishes filming its Greatest Generation Workout video which will be featured in 600 locations throughout the U.S. and in 13 countries. April 23, 2014 - The Geri-Fit exercise program makes the grade and is added to the CDC's "Future Possibility List" as a possible arthritis appropriate intervention. We are looking for study subjects that want to be involved in a research project which will begin some time in January 2015. If you'd like to be enrolled in the study, please contact us. Additionally, if you have arthritis and have found Geri-Fit to be beneficial to you, we want to hear from you. Please contact us at 1-888-437-4348 and share your story. February 12, 2014 - The Geri-Fit Company wins the 2013 Best Emerging Business award presented by the Economic Development Corporation (EDC) of southwest CA. January 30, 2014 - Geri-Fit makes the front page of the San Diego Union Tribune newspaper! The article discusses the many different Geri-Fit classes that are held at the Kay Ceniceros Senior Center in Menifee and the upcoming Senior Activity Day that will be held on Wednesday, February 19. Seniors from all over can attend the event and sample many exercise programs for FREE that day. Mayor Scott Mann will be the keynote speaker and will be kicking off the continental breakfast at 8:30 am. January 23, 2014 - Santa Ana College is the first college in the country to offer the new Advanced Strength Training Techniques for Older Adults instructor training program. This course will be offered on Saturday, May 3 from 10 am- 6:00 pm. To register or for more info, visit this link at Santa Ana College's website. 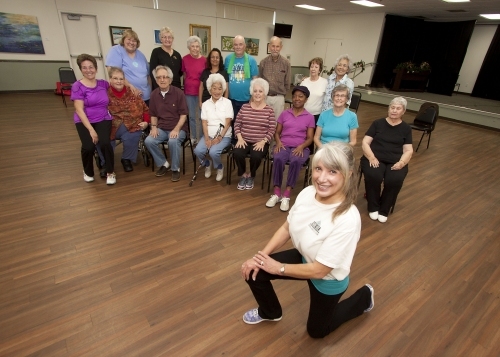 January 22, 2014 - The Menifee Buzz featured a news story about the new Geri-Fit Stretch class that is held at the Kay Ceniceros Senior Center in Menifee, CA. To read the article, click here. January 16, 2014 - The new online Advanced Strength Training for Older Adults instructor training program gets approved by ACE and awarded 2.0 CECs, and 2.0 CEUs by NSCA. Now learn Geri-Fit from the convenience of your home and become a Senior Strength Training Specialist. For more information on this course that's available to instructors nationwide, follow this link. 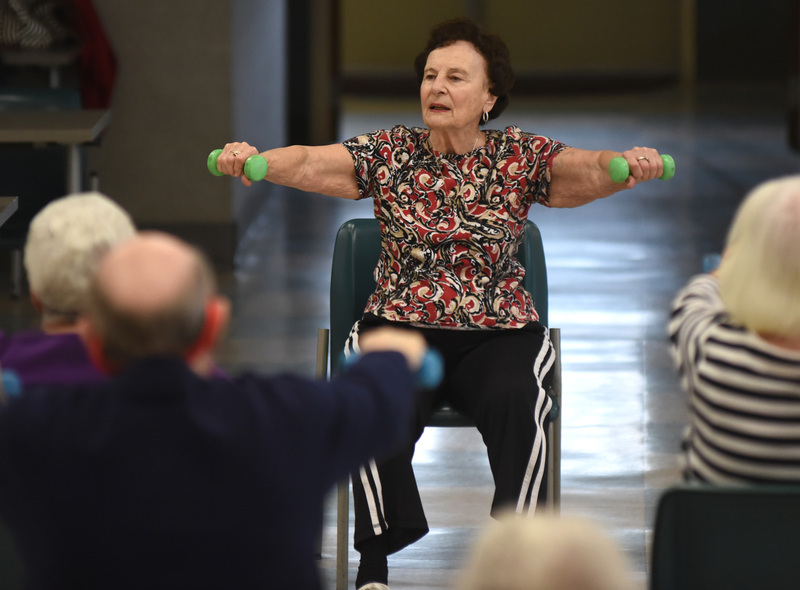 December 24, 2013 - The Menifee Buzz online newspaper wrote about the personal fitness training services offered to older adults at the Kay Ceniceros Senior Center in Menifee, CA. Over 70 Geri-Fit classes are taught at their facility each week (group Geri-Fit classes, one-on-one Geri-Fit Private Lessons, and the new Geri-Flex™ stretch classes. To read the entire article, Click Here. December 1, 2013 - Neighbors Newspapers, the Inland Empire's largest free newspaper, writes about Geri-Fit exercise classes that will start in January 2014 at the City of Lake Elsinore, California. To read the announcement, see page 36 at this link. November 23, 2013 - The City of Lake Elsinore will begin offering Geri-Fit strength training exercise classes for older adults in January 2014 in addition to the company's other popular Body Sculpting program and Just Arms & Legs classes. To read the entire article that appeared on Patch, click here. September 20, 2013 - In recognition of National Fall Prevention Week, Globenewswire features four tips for helping seniors prevent falls. Geri-Fit is recommended as an exercise program that seniors can do in order to increase their strength. To read the article, Click Here. September 19, 2013 - The Geri-Fit Company is invited to attend VNA California's Health Fair tomorrow September 20th at Grand Isle in Murrieta, California. We'll be giving strength training tips and discussing ways in how to prevent falls, how to increase your balance in addition to the many services VNA California will offer such as free blood pressure screenings, Sit-to-Stand tests, nutrition tips and other useful healthcare for seniors. September 13, 2013 - Bloomberg Businessweek.com mentions the Silver&Fit® endorsement of the Geri-Fit® strength training exercise program. To read the article, visit this site. Yahoo Finance also featured the story on their website at this link. September 13, 2013 - CNBC.com picks up on the news story from American Specialty Health and features it on their website. To view the article on CNBC's website, click this link. 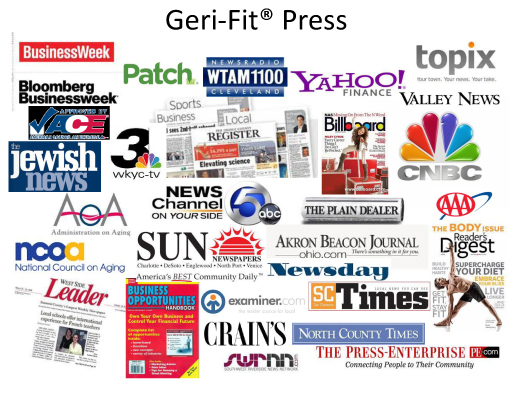 September 12, 2013 - The Silver&Fit® endorsement of the Geri-Fit® strength training exercise program for older adults was released this morning at 6 am and instantly made national headlines. The Geri-Fit® training program is now available to instructors throughout the United States that want to learn how to teach Geri-Fit®. Geri-Fit® is an endorsed exercise program through the Silver&Fit Healthy Aging Program which is available to Medicare Advantage members. To read the entire article, visit American Specialty Health's website at this link. September 11, 2013 - The National Council on Aging and the Geri-Fit Company partner together to teach seniors the importance of strength training and fall prevention. During National Fall Prevention Week, participating Geri-Fit® locations will be offering FREE Geri-Fit exercise classes during the week of September 22-28. For more information, read NCOA's entire press release. September 10, 2013 - The Geri-Fit Company finalizes editing of its new instructor training dvd so that instructors from afar can learn the training methods needed to effectively teach the Geri-Fit® exercise program at health clubs, physical therapy centers, senior centers and other places that offer group exercise classes for older adults. 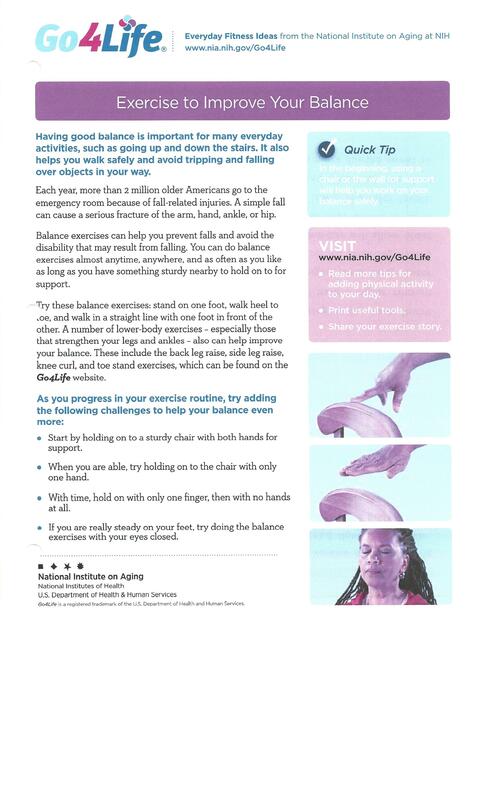 August 26, 2013 - The Geri-Fit® exercise program was mentioned in the News and Notes for Go4Life® Team Members from the National Institute on Aging at NIH's (National Institute of Health) August monthly newsletter. August 19, 2013 - Geri-Fit® has partnered with the Go4Life® program through the National Institute of Health and the National Institute on Aging. Free information about senior health and exercise is available through their website at this link. August 1, 2013 - Geri-Fit® was featured in the Orange County Register reporting about Geri-Fit® exercise classes that are held in held in Tustin, California. A free trial class is available throughout the month of August to anyone who would like to try it out! Just show up any Tuesday or Thursday at 1:15 pm. Click HERE for directions and dates. July 23, 2013 - Geri-Fit® Strength Training for Seniors instructor training program receives CEC approval from the American Council on Exercise (ACE) and is awarded .8 CEC's. Geri-Fit's first national training program for instructors teaching at licensed facilities throughout the U.S. will be held on Saturday, November 9 in Temecula, CA. July 12, 2013 - Press Enterprise.... Geri-Fit loves you! 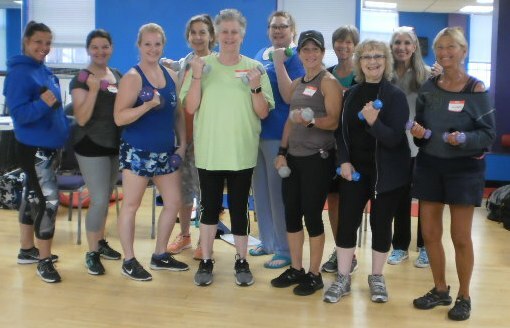 Here's a wonderful article on the FREE trial Geri-Fit class that's being offered throughout the month of July at the French Valley Community Center in Murrieta. And, special thanks to Betty White! To read the article, just Click Here. June 3, 2013 - Special thanks to Southwest Riverside News for their story on Geri-Fit's expansion into Riverside County. Geri-Fit® and Body Sculpting™ classes will be offered at three new Riverside Parks and Recreation facilities such as Bordwell Park, Springbrook, and Nichols Park. To read the article, just Click Here. May 23, 2013 - The Geri-Fit Company partners with GlobalFit to offer insureds across the U.S. with fitness discounts to take Geri-Fit strength training exercise classes. May 7, 2013 - The Administration on Aging (AoA) Evidence-Based Programs Review Committee finds the Geri-Fit® program to meet the highest-level criteria, Title IIID, for AoA's evidence-based disease prevention and health promotion programs. February 28, 2013 - The Women's Business Enterprise National Council (WBENC) approves the Geri-Fit Company LLC as a certified woman-owned business as well as an approved government vendor. 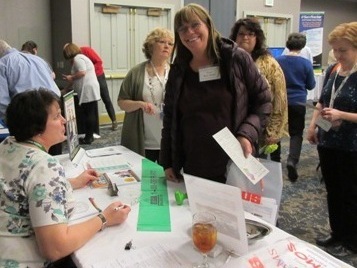 January 13, 2013 - VNA California hosts the first Osteoporosis Workshop which was a sell out with more than 50 seniors attending this free event. Geri-Fit founder, Francesca Fisher, lead the workshop. 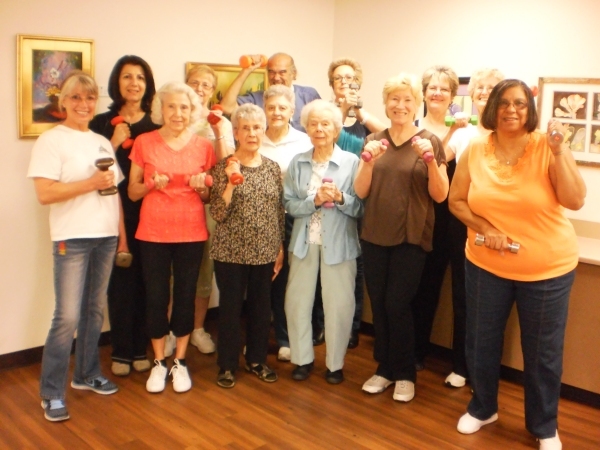 Some of the many Geri-Fit® participants at the Kay Ceniceros Senior Center in Menifee, CA. Age ranges are 62 to 94. In memory of Jane Young (center) who passed away on Nov. 1, 2013. Tustin, California's classes started off on the right foot with an article in the Orange County Register on January 22, 2013. Many thanks to Elysse James for writing such a great article! Many thanks to the Press Enterprise for the great article on Geri-Fit's partnership with the Visiting Nurse Association of California where osteoporosis workshops will be conducted during the month of January, 2013. Southwest Riverside News Network published a story on January 7, 2013 about Medicare's new Advantage program where seniors can now exercise for free or at low cost thanks to Silver&Fit's umbrella of exercise programs which now includes Geri-Fit. Many thanks to NewsWeek Magazine for including Geri-Fit in its final December 31, 2012 commemorative print edition! We wish you much success with your new online NewsWeek version. Thanks to the North County Times for its Septemer 24, 2012 business announcement about our new location opening in Murrieta at the French Valley Community Center which is part of Valley-Wide Parks and Recreation District. Now Silver&Fit members can participate in the Geri-Fit exercise program for FREE! starting in 2013. To see if Geri-Fit is covered under your insurance plan, call the toll-free Member Services phone number on your insurance card or 1-800-MEDICARE. If Geri-Fit is not covered under your plan, suggest it and your insurance company will contact us so that free benefits are made available to you. To read the entire article in North County Times' Newspaper, CLICK HERE. Thanks to the Press Enterprise for its Business Spotlight interview with Geri-Fit's founder, Francesca Fisher. To read the online article, just click here. Geri-Fit opens three new locations in southern California at Valley-Wide Recreation Centers located in San Jacinto, Murrieta, and Winchester. For the complete article, click here. To read about the study that included the Geri-Fit exercise program, click here. The study findings were also published in the American College of Sports Medicine Journal May, 2011: click here. and CLICK HERE to view a small video about the study with Geri-Fit.